Traditional Chinese gardens represent idealised miniature landscapes and construct harmony between man and nature, by using delicate arrangements of plants, water, rocks and architecture. 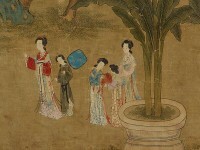 Flowers and trees are the essential elements of the Chinese harden as they evoke the natural world. In a Chinese garden, people do not only enjoy the plants’ colours and forms, but also the aromas and even sounds (the sound of rain on banana leaves and lotus leaves, or wind through the bamboo). Though climates and soil conditions vary in the vast territory of China, some plants have been favoured and cultivated in gardens all over the country, as they have particular symbolic meanings. 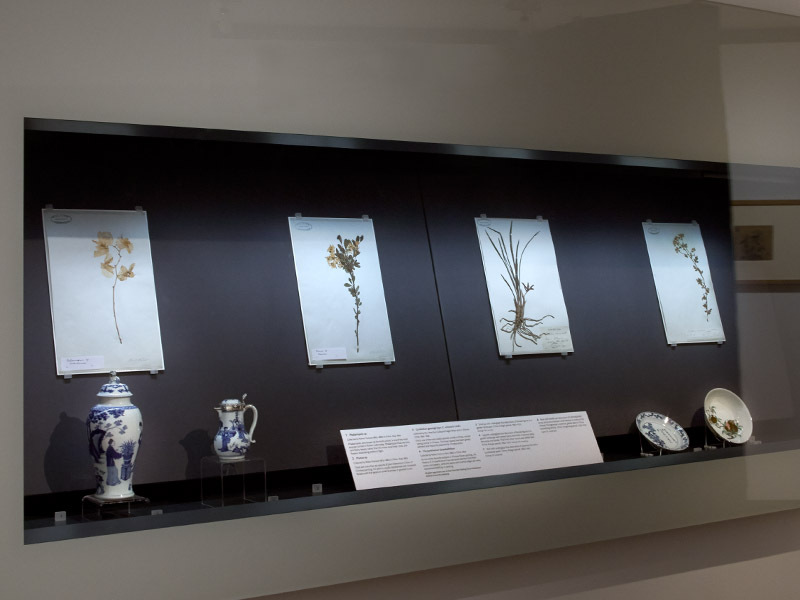 These plants, such as pine, bamboo, Chinese plum, orchid and chrysanthemum, have also been common subjects of Chinese art and literature, as well as traditional motifs. 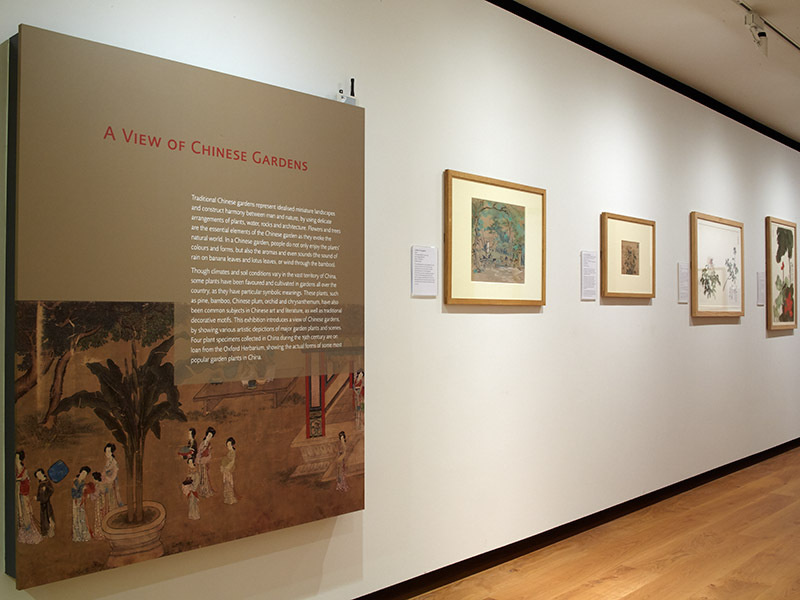 This exhibition introduces a view of Chinese gardens, by showing various artistic depictions of major garden plants and scenes. 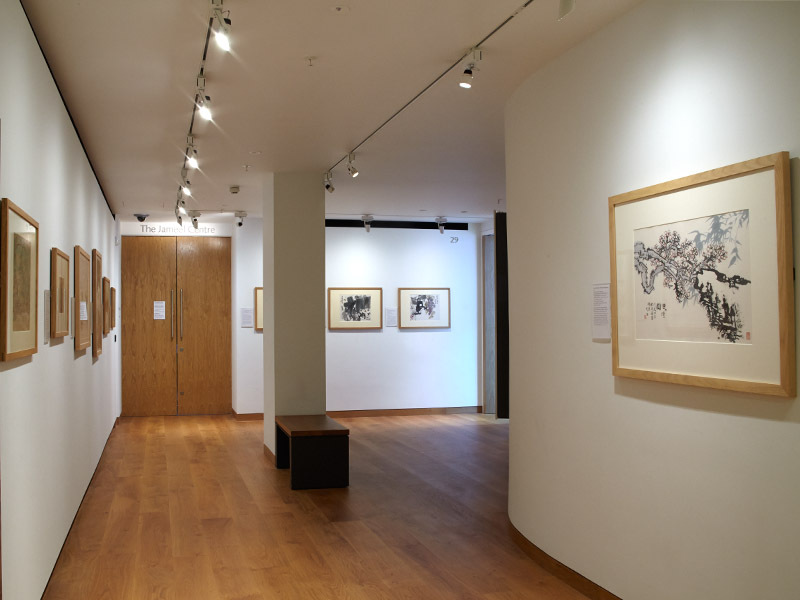 Four plant specimens collected in China during the 19th century are on loan from the Oxford Herbarium, showing the actual forms of some most popular garden plants in China. Eastern Art Paintings Gallery - Chinese Gardens panel. Eastern Art Paintings Gallery - Chinese Gardens vitrine case. Eastern Art Paintings Gallery - Chinese Gardens detail.